In 1896 Sam Paley opened Congress Cigar Company in Chicago and he produced a cigar called La Palina named after his wife, Goldie. When Sam retired, La Palina was put to rest. 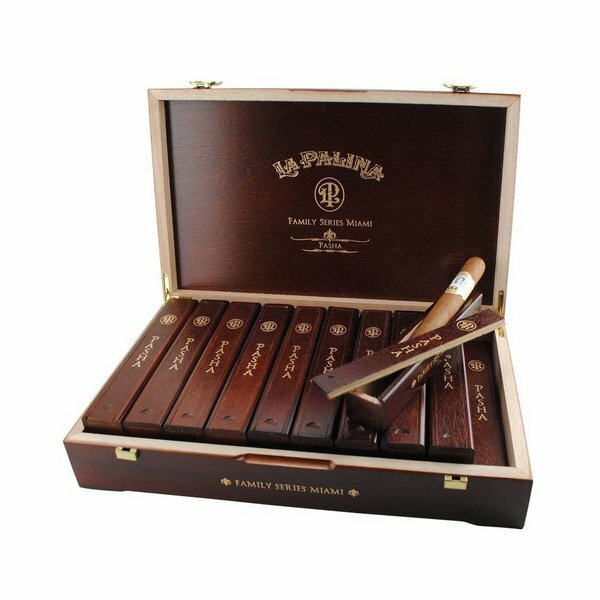 In 2010, Bill Paley, in collaboration with Graycliff Cigar Factory in the Bahamas, resurrected the La Palina Family Series. After the relationship with Graycliff ended, Paley along with El Titan de Bronze Cigar Manufacturer gave rebirth to the brand with a different blend and new name; La Palina Family Series Miami. La Palina Family Series Miami pays homage to the Paley’s family. Each vitola is named after a member of the Paley family. The Pasha is a Churchill in honor of Bill’s father William S. Paley. The updated blend of La Palina Family Series Miami incorporates an Ecuadorian Corojo ’98 wrapper, a medium brown Ecuadorian Habano binder, and all-Nicaraguan filler from the Jalapa and Estelí regions. Handcrafted in the United States, Family Series Miami is a medium-bodied full flavored cigar. Notes of coffee, almonds, buttery caramel, exotic spice and subtle sweet fruitiness are present throughout the smoking experience. It’s Halloween night and your cigar aficionado neighbor is stopping by with his little monster. You have Reese’s for the little one but what about the big guy in a Batman costume? How about a La Palina Family Series Miami Pasha presented in an individual wooden coffin? The redwood colored boxes are a creative presentation for the beautifully banded Pasha and certainly make a lasting impression.